The Timber Management Group develops forest management tools and information to sustainably manage the provinces wood products resources. This mandate is carried out by collecting data regarding forest resources and how they are affected by silviculture and harvesting. Trials, experiments and surveys are carried out in cooperation with forest owners and managers. This information is used to develop decision keys, models, regulations and policies used by forest managers and policy makers of private and public lands. The results of a comprehensive survey of 7-9 old selection harvest operations. Download the report. The Tolerant Softwood/Mixedwood guide is published and available for use. The Tolerant Hardwood guide is published and available for use. An inventory of the province's Hardwood Sawlog Resources is now available. Click to view. 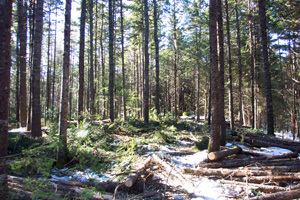 Updated model includes hardwood species and commercial thinning of softwoods. This model is now available for download along with a technical description for Hardwoods and Softwoods and a user manual.